Winsor & Newton's Artisan Water Mixable Oil Colour has been specifically developed to appear and work just like conventional oil colour. Like traditional oil colour, ArtisanWater Mixable Oil Colour is made from linseed oil and safflower oil.The only difference is the linseed oil and safflower oil used in Artisan have been modified so that they will mix and clean up with water. Artisan has been specifically developed to appear and work just like conventional oil colour.The depth of colour, buttery consistency, lightfastness, opacity/transparency, performance and drying times of Artisan, allow artists to use this range for all oil colour techniques. 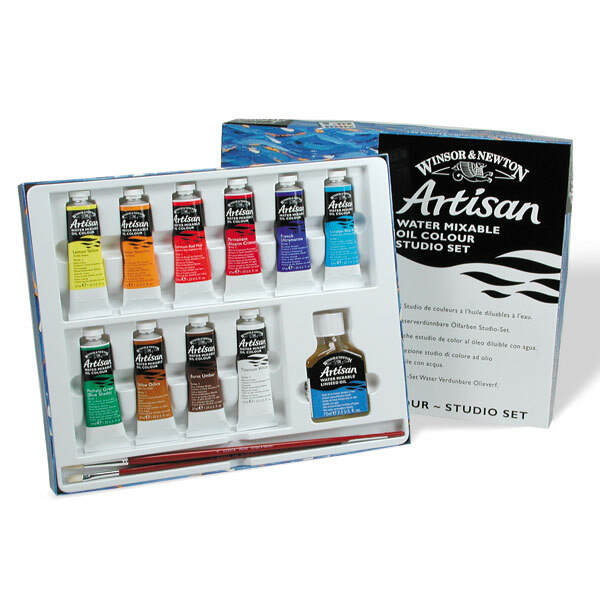 The Studio Set contains a range of ten 37ml tubes plus 1 bottle of water mixable linseed oil and 2 Artisan brushes (flat size 2 & round size 4).